Στο τέλος του παραδοσιακού οικισμού της Οίας, με θέα στην Καλντέρα και το Ηλιοβασίλεμα βρίσκεται ο ανακαινισμένος παραδοσιακός ανεμόμυλος από το 1900, ο οποίος έχει τρία ορόφους με σκάλες για να φιλοξενήσει ένα ζευγάρι με δύο παιδιά ή εναλλακτικά τέσσερις ενήλικες. Με απλό και ελάχιστο στυλ, ο μύλος περιλαμβάνει στο επάνω μέρος του 3ου επιπέδου ένα διπλό κρεβάτι, στο μεσαίο τμήμα το σαλόνι, την κύρια είσοδο και στο κάτω μέρος το 1ο επίπεδο ένα δεύτερο υπνοδωμάτιο, η κουζίνα, το μπάνιο και το 2ο Είσοδος. Έξω από τον ανεμόμυλο υπάρχουν δύο ιδιωτικά μπαλκόνια με θέα στο ηφαίστειο, τη θάλασσα και το περίφημο ηλιοβασίλεμα της Οίας. Λίγα βήματα κάτω από το Windmill (περίπου 20 μέτρα) είναι το καφέ μας «Lioyerma Pool Bar» (με θέα το απέραντο γαλάζιο του Αιγαίου με το μοναδικό Ηλιοβασίλεμα της Οίας για να σας προσφέρει δωρεάν πρωινό και να σας δροσιστεί στην κρυστάλλινη πισίνα σε ένα φιλόξενο περιβάλλον. Διατίθεται δωρεάν πρόσβαση στο Internet (Wi-Fi) και Ιδιωτικός χώρος στάθμευσης. Το πρωινό και οι δωρεάν ξαπλώστρες δίπλα στην πισίνα συμπεριλαμβάνονται στην τιμή. Το μπάνιο βρίσκεται στο 1ο επίπεδο του ανεμόμυλου δίπλα στο 2ο υπνοδωμάτιο και τη 2η είσοδο. 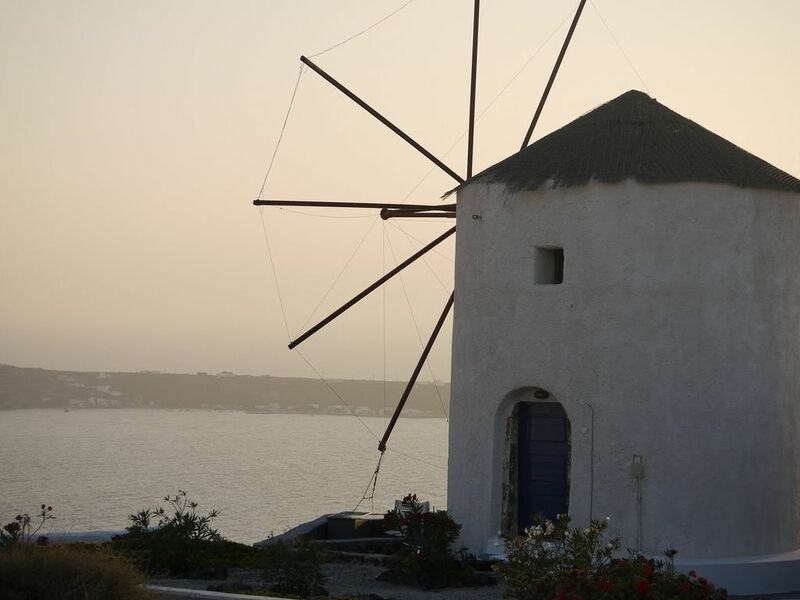 The Lioyerma windmill is a romantic little get-away set in some of the most dramatic scenary in Santorini. In the evening, people flock from all over the island to this furthest point in the town of Oia to soak up the famous Santorini sunset where the windmill commands the perfect private patio from which to enjoy it. And they truly are breathtaking! Manos and family are incredibly welcoming and will do anything to make sure all your holiday needs are catered for, sorting out transfers, taxis, and restaurant reccomendations whilst keeping the windmill clean and the towels changed with a daily visit whilst you’re out. Accomodation includes access to one of the best pools in Oia, which offers an included breakfast, reserved sunbeds and special rates on the bar menu. The staff really looked after us whilst we were there. You can also enjoy a perfect sunset from here too if you fancy a more lively atmosphere. We had a wonderful time and would reccomend to anyone looking for something a little different, cosy and romantic with a fantastic warm and welcoming host. Be aware that because this is a restored windmill, the stairs are steep, although this wasn’t a problem for us. Thank you Manos and family and all the folks at Lioyerma. It was Perfect! Clean, well kept, service amazing and knowledgeable. This property is exactly how it is described. The location and views are superb. No surprises and Manos is a kind and generous host. Location, die alle Erwartungen erfüllt. Die Lage ist einzigartig, die Unterkunft ebenfalls. Geschmackvoll eingerichtet und in einem sehr guten gepflegten Zustand. Gebäude bedingt ist es natürlich eng und sehr steile Treppen, man gewöhnt sich aber daran. Sehr aufmerksamer, freundlicher und hilfsbereiter Gastgeber. Das Frühstück ist sehr gut und umfangreich. Täglicher Handtuchservice. Wir waren begeistert. Great value for this unique stay! It is not too often you get to say you stayed in a windmill - for that experience alone, I would recommend this. The windmill is on the quieter side of Oia, which we loved, but still steps away from everything! My daughters loved having the top floor, while my husband and I stayed on the bottom floor - close to the bathroom. You do have to be good with narrow stairs/ladder to get to the bottom floor, but we got used to that very quickly. What made this a five star experience was the treatment by Manos and his family and the staff at the pool bar (great pool, by the way). They treated us like royalty with welcome drinks/snacks, there was always reserved seats for us at the pool bar, a good-bye lunch, and even surprised us with bottle of wine and platter for our anniversary, which we enjoyed on our balcony over-looking the sunset. While everyone is scrambling to find a place to watch the sunset, you have your own private balcony to watch. This really was a perfect place for our family of four. A great value and highly recommended. Thanks Manos!!! We arrived on Santorini by ferry, had organised a transfer to Oia through Manos and arrived at this delightful property. It was sunny every day, it was dry every day ! The windmill was cosy and a great shelter from the sun in the middle of the day. Each morning we would go to the pool and have breakfast and a swim before anyone else arrived at ten in the morning. It was beautiful and so relaxing. The staff were fabulous, friendly and accommodating..
Each day we’d go out either walking into Oia or get a bus to another part of the island. There is much to see and do, and many places to eat suiting all pockets. The open air cinema and the ancient remains at Thera are both worth a trip to the other end of the island. Down ar the sea front the local food was always a little different but delicious and very competitively priced! For a good gyro, and we would certainly recommend you try one , Fira is the place to go. Overall our stay in Oia was one of the nicest and most relaxing holidays we have had. The variety of things to do and see is amazing yet there is no pressure as in other Mediterranean locations. The Windmill was very close to the pool and each evening we sat outside watching the sun go down with a beer and food! First time to Greece and Santorini. Lovely place and fabulous people. The cafe/ pool area is a mecca for visitors and it is easy to see why. All the staff were so helpful and courteous that it is a destination we shall be heading for again, and the Windmill our first choice for accommodation. A very big Thank You for a superb break.